Looking for a Used Huracan in your area? CarGurus has 254 nationwide Huracan listings starting at $169,955. The Lamborghini Huracán sports coupe enters its third year of production with a full complement of trims and body styles, highlighted by a new rear-wheel-drive (RWD) Spyder convertible that debuted at the 2016 LA Auto Show. The automaker now offers its low-slung, rip-roaring street racer in both hardtop coupe and soft-top convertible body styles and on all-wheel-drive (AWD) and RWD platforms. Though they differ in minor ways, each is infused with Lamborghini's super-sports-car DNA, and they form a formidable team guaranteed to turn heads and garner looks of curiosity and desire wherever they go. And where they go, they go fast. 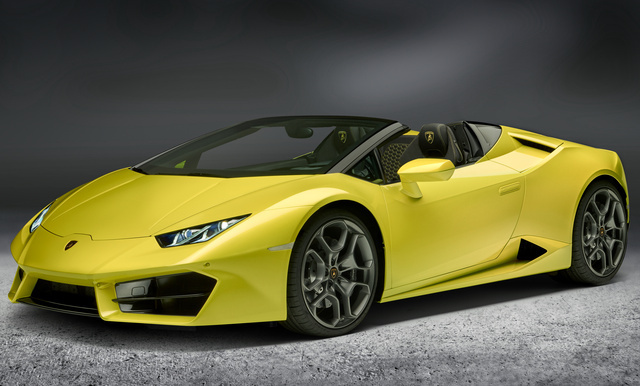 Officially known as the Lamborghini Huracán LP 610-4 and LP 580-2 (AWD and RWD variants, respectively), the automaker's newest sports car was named for a famous Spanish fighting bull—much as the Gallardo, which the Huracán replaced in 2015, also took its name from the bullfighting world. Of course, Lamborghini's badge depicts a raging bull, inspired by founder Ferruccio Lamborghini's respect and admiration for these great fighting beasts, and it continues to serve as an appropriate symbol. Lamborghinis may be automotive beasts, but they're refined, stylish, and highly manageable beasts that could conceivably serve as daily drivers. The heart of any Lamborghini is its powerplant, and that remains true for the Huracán, as well. But it's the exotic yet functional exterior design that makes the bold first impression, with its futuristic profile and lines that flow from stem to stern in an organic yet controlled manner. A short, arrow-shaped hood gives way to a massive windshield and a roofline that tapers gradually towards the hunky rear end. A smooth lower line running from front to rear along the tops of the doors pulls the exterior together into a cohesive yet intriguing overall look. Lamborghini aptly describes the Huracán's nose as shark-like, and there's a certain predatory element to the entire exterior design—aided in part by the geometric shapes, directional fins, and cooling air intakes that jut out in front of the rear wheels. Aluminum and carbon-fiber body panels help keep the weight down while ensuring both good aerodynamics and aesthetics. LED headlights and taillights, a front air splitter, an integrated rear spoiler, heated power-folding side mirrors, and a completely paneled underbody are among the standard exterior features. Spyder variants come equipped with a lightweight, sound-insulating soft-top roof that raises and lowers in 17 seconds at speeds up to 30 mph. Buyers can choose from 17 exterior paint colors including metallic, pearlescent, and matte finishes, and the European market receives access to a special-edition, limited-run Avio trim sporting unique aviation-themed exterior paint, trim, wheels, and badging. The Huracán's high-performance, naturally aspirated 5.2-liter V10 engine sits mid-body, behind the cabin and in front of the rear axle, and is positioned longitudinally at a 90-degree angle ("longitudinale posteriore" in Italian, which is abbreviated as “LP” in the car's full name). For those who wish to admire the engine on a daily basis, Lamborghini offers a transparent cover with carbon-fiber engine bay cladding for obstruction-free viewing. Output from the V10 varies depending on the Huracán’s body style. With AWD, the V10 generates a hefty 601 hp and 413 lb-ft of torque in both the coupe and convertible variants, and it propels the car to 60 mph in 3.2 seconds and on to a top speed of 201 mph. The engine links to a 7-speed Lamborghini-designed dual-clutch transmission and utilizes stop-and-start technology to keep fuel consumption down, managing numbers of 14 mpg city, 21 highway, and 17 combined in the coupe and 14, 20, and 16 in the convertible. Following the AWD trims, Lamborghini introduced RWD versions of both the coupe and Spyder convertible with a slightly detuned V10 capable of 580 hp and 398 lb-ft of torque. The RWD trims can hit 60 mph in 3.6 seconds and reach a top speed of 198 mph. This engine links to the same dual-clutch transmission as the AWD variant and gets the same fuel-economy figures of 14, 21, and 17 in the coupe and 14, 20, and 16 in the convertible. The Huracán’s AWD system, which typically sends about 70 percent of torque to the rear wheels and 30 percent to the front, provides optimal traction and stability, especially when accelerating out of corners. The RWD system, however, gives owners a chance to fully unleash their car's dynamic driving capabilities. Both platforms feature a self-locking rear differential for improved traction under aggressive driving. Electromechanical speed-variable rack-and-pinion steering provides a precise feel and good feedback, and the available Lamborghini Dynamic Steering (LDS) tightens its response even more and minimizes over- and understeering. Drivers can choose between Strada (Street), Sport, and Corsa (Track) driving modes, which adjust the lateral dynamics and the throttle, transmission, exhaust, dampers, and stability-control system for maximal handling and stability. Drivers can also switch off the stability control completely for track driving. The Huracán sits on a lightweight hybrid chassis composed of aluminum and carbon-fiber-reinforced polymer. At just 440 pounds, the chassis not only helps with overall weight reduction but also provides optimal stiffness and sharp handling. Carbon-ceramic brakes, which are designed to quickly dissipate heat, come standard, with a variety of paint colors for the calipers. AWD trims ride on 20-inch silver-alloy wheels with specially developed Pirelli tires, while RWD trims get 19-inchers. With a low, sloping roofline that’s only 45.9 inches at its highest point, the Huracán’s 2-passenger cabin can be rather tight for taller occupants. It features heated, well-bolstered, power-adjustable leather seats, a tilt/telescopic steering column, and a premium-leather sports steering wheel with contrast stitching and paddle shifters. A 12.3-inch TFT virtual instrument cluster and dash borrowed from Audi take center stage, and covered toggle switches and well-designed knobs are located in the center stack. The Huracán’s rear visibility can be limited, making the reversing camera an important feature. Interior storage spots are also scarce, and the cargo space under the front hood can hold only a few daypacks or overnight bags. As you'd expect given its design and performance features, the Huracán handles exceptionally well in traffic, with a light, precise feel that gives the driver the sense the car is skimming over the surface of the road. The mid-mounted engine and low center of gravity result in highly controlled and balanced handling, and the car’s steering is responsive. Once out of the city limits, switching to Sport mode loosens the car's driving dynamics and kicks up its engine note, making for a spirited ride with a throaty roar that any raging bull would be proud to hear. What's your take on the 2017 Lamborghini Huracan? Users ranked 2017 Lamborghini Huracan against other cars which they drove/owned. Each ranking was based on 9 categories. Here is the summary of top rankings. Have you driven a 2017 Lamborghini Huracan?